Over the past few months, I’ve been giving a lot of thought to our investment mix. We’re now maxing out our available retirement options, so we’ve turned our attention to investing in a taxable account. This brings up a number of issues related to both asset allocation and asset location. While we need to maintain a reasonable overall asset allocation, we also need to be careful to maintain tax efficiency in our taxable account. Yesterday I finally decided to slice and dice our various accounts to figure out exactly where we stand with regard to asset allocation. 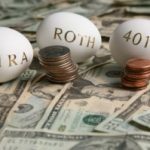 For starters, my wife and I both have Roth IRAs with Vanguard, though we’re not currently eligible to make contributions. I also have a SEP-IRA and a 403(b) at Vanguard, as well as a 457(b) at TIAA-CREF, and another work-related retirement account at Fidelity. Finally, our taxable account is at Vanguard. In our other (non-Vanguard) retirement accounts, I’ve created a reasonable facsimile of this mix, with 72% in a total stock market fund, 18% in an international index fund, and 10% in a total bond market index fund. In our taxable account, our only current holding is the Vanguard Total Stock Market Index Fund. Based on the above, my general feeling has been that we have too little in terms of international exposure, due in large part to the absence of international holdings in our taxable account. I’d also like to bump up our bond exposure in our retirement accounts to offset the 100% equity stance in our taxable account. That being said, I had never really lumped everything together and then broken it down. Overall, this exercise confirmed my suspicions… I’d like for us to be a bit heavier in terms of both bonds and international equities. In the end, I’d like to have roughly 80% in equities and 20% in bonds. For that 80% equity stake, we’ll probably end up shooting for 50-55% in domestic equities and 25-30% in international equities. While we’ll likely be adding an international fund to our taxable account, and also picking up additional bond exposure in our retirement accounts, we might also end up dropping the Target Retirement 2035 funds and replacing them with a simple mix of our own. Of course, there are other, finer distinctions to consider. For example, the breakdown of large vs. small cap stocks is an important factor, and the MSCI Broad Market Index upon which the Total Stock Market Index Fund is based is actually rather light on small caps. Similarly, we’ll need to take a look at the specific mix of international equities to be sure that we’re happy with the balance of developed vs. emerging markets. If you have any thoughts, please don’t hesitate to share them. This trade-off about whether international investments should be in tax-deferred or regular accounts needs more detailed analysis. In tax deferred acoounts, one would loose tax-credits for foreign taxes paid. In taxable accounts one would pay taxes on dividends & cap-gain distributions and loose tax-deferred compunding. I an curious if anyone can share the actual #s from VWO or other such foreign ETF. You only get the foreign tax credit if foreign taxes have been withheld at the source (rare for most dividends), and you only benefit to the extent that the income is taxable in the US. Which is exactly the case with VEU/VFWIX. Yes, but if it’s in a tax deferred account, you can’t get a credit for it because the dividend is taxed before it is paid to you. In a taxable account, you can take the credit on your taxes. If you have equity holdings in a taxable account, it should be the international ones – in the form of VEU or VFWIX – so that you can capture the foreign tax credit. You only get the foreign tax credit if foreign taxes have been withheld at the source (rare for most dividends), and you only benefit to the extent that the income is taxable in the US. You can roll the unused credit over to future years, but the credit can only be applied to offset taxes on foreign-sourced income income – which you probably won’t have. The bottom line is you’re still paying tax on those dividends, and chances are you’re being taxed at regular income rates. You won’t ever pay less taxes due to the FTC, and there’s a good chance you’ll pay more. This credit is lost when these funds are held in a tax deferred account. Also, do not use Vanguard Total International because it is a “fund of funds” and it not eligible to receive the foreign tax credit. The allocations seem fine, but be sure to keep all your international holdings and REITs in your tax sheltered accounts; dividends from those kinds of holdings tend to be non-qualified. Non-exempt bonds come next, then large cap value stocks. Small cap growth stocks tend to have lowest yields – this is what you want in your taxable accounts. Be careful about stunting the growth of your retirement accounts because you are overweight on bonds. Your retirement accounts are long-term investments and their risk profile should reflect that. Tax-free/deferred compounding is preferable to doing it in a taxable account. Also, since you may tap your taxable account for (as yet unforeseen) mid-term goals, you may want to consider establishing a position in a bond fund in your taxable account instead. You should check out the book: All About Asset Allocation. It’s part of the All About series. It describes many different asset allocations for different age groups. In my opinion, whether or not to switch away from your current 2035 fund should depend on how much you currently have invested. As long as you can meet the minimum investments in all of your new asset allocation funds, you’ll avoid the minimum fee. You are still young enough to have 15% in bonds, 95% equities. Equity = 25% international, 55% domestic, 15% REIT. Within you 55% domestic be sure to diversify with Total Market, Large and Small/Mid Cap funds. 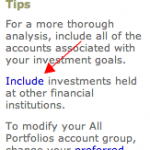 Thanks, Kurt, for the heads-up on Vanguard’s site. (I found it under “Portfolio Analysis”, actually.) I had been thinking a while about checking my overall asset allocation, and it took me all of five minutes to enter my other holdings and see my pretty pie chart. Oh, and your allocations seem reasonable. I’m more of a 20 Bonds / 40 Domestic Equity / 40 International equity guy myself. Just trying to match my assets to my liabilities (I think we’re a much more international economy than people believe and will only become more so). The Portfolio Watch feature of Vanguard will do these types of calculations for you automatically. If you’d like, it will even pull in info from other accounts. I use it, and love it. We’re also trying to add to our international holding. Vanguard put together a great paper that suggested 20% – 40% was reasonable. Also, I wouldn’t worry about when you do it. You don’t try to time the market as it is, so it wouldn’t make any sense to try to time a shift in asset allocation. i think intl’s are good now, but their fundamentals are worse than the u.s. the only problem is that there is a delayed affect. Great article – I went through a similar exercise a year ago – funny enough, I’m still working on it! I agree your bonds should be higher – I don’t have any great pearls of wisdom about how much but I think 10% isn’t enough to make a huge difference in volatility. I think 20-25% is more meaningful so either increase (as you said) or don’t bother having any. I think a bit more foreign diversification is a good idea but considering the diversity of the US markets and the amount of multi-nations you guys have – you don’t have to go overboard. Man, I love asset allocation! With the US financial markets in such mess, you would might wanna reconsider your asset allocation to Domestic Equities. Have you ever checked out any of Paul Merriman’s articles at FundAdvice.com? There are 2 articles there in particular that directly address your topic – “The Ultimate Buy-and-Hold Portfolio” and “Fine Tuning Your Asset Allocation” – but there are a lot of other good (and free) articles all through out the site. (and no, I am not affiliated with him in any way – I am just trying to share a good resource that I have found). I think that’s the smallest number of funds that hit all the “major” asset classes. “Large Cap” is really “large and mid cap” stocks. Many would argue to add more funds to tilt towards value stocks, but with 5 asset classes already I don’t think the added complexity is worth it. It’s ironic – the endless hours of tweaking portfolios/thinking about portfolios/buying books, reading articles about investing/etc. with the ultimate goal of providing for those days of “golden leisure”, b-u-t then not completing legal documents of their/their spouses “what-if” affairs (durable power of attorney/living will/”do not resuscitate” wishes/and so on). I think I know why though. Focusing on money and getting more is far more attractive to ponder than thinking about ones demise. Sorry for wandering off-topic on this thread, but this advice needs to be restated. Don’t leave your loved ones with decisions that they are ill equipped to make under emotional duress. While you’re at it, go over your/your families health care/disability/long-term care coverages with a magnifying glass. I have seen my share of those “best laid plans.” take a hit from medical events/ancillary costs associated with same. I also speak from experience, having seen my late wives medical costs exceed three-quarters of a million dollars, and even with a comprehensive Blue Cross/Blue Shield PPO, there are many expenses that you will find yourself paying for during a lengthy illness if you can’t keep working full time – travel costs/procedures outside coverage/etc. “We’re still pretty young”, “our family medical history is good”, “I can start those coverages later in life”, “My medical plan is very good”. Exchanged stories with many people who thought they too were protected. Now we who know, know better. Plan now before the need arises. 1. If you DO want to invest in ‘product’ just make sure that these are long-term positions in LOW-COST Index Funds (BTW: better than ETF’s) … fees really DO make a difference. 2. If you want to take a more active position like Warren Buffer (or me), then buy a book called Rule # 1 Investing by Phil Town and pick just 4 or 5 stocks in businesses that you undertand and love and that are UNDERVALUED (must be plenty out there now). If my time horizon were 20 years or longer, I probably wouldn’t pay much attention to current market conditions. I’d just go ahead and do what I had to do. The only think about holding target retirement funds is that it makes things complicated if you have multiple retirement accounts with different tax characteristics. Debbie: I agree that now is a bad time to make any sudden movements away from domestic equities. What I’m working on right now is sorting out exactly where we want to be in the long run. From there I’ll work out the optimal structure of our portfolio in terms of tax-advantaged vs. taxable account. At that point, we’ll likely rebalance gradually (with new money) by tweaking our contribution percentages rather than by making any sudden shifts. You might also consider Index Linked CDs in your taxable account. While not that well known these instruments are widely available in the marketplace. There are many structures available at any given time but the general idea of these investments is to protect your principal investment while allowing for participation in the upside depending upon the index to which the CD is tied. In this way it combines elements of fixed income and equity investing. In a volatile market this is provides for decent diversification without downside risk. You don’t want to sell low and buy high. You might want to hold off for a while or figure out a gradual way to rebalance. Steve, I’ve considered REITs, but I really need to shoehorn them into the retirement accounts because of the dividends. The only way to “safely” own them in a taxable account is via an annuity. While Vanguard has a decent Variable Annuity REIT Index, it’s still somewhat more costly than true index funds. Your point about international bonds is well taken, and I haven’t given that much thought. Nice job. REITs, international and domestic, offer some diversification benefits as they are usually loosely correlated to stock returns and often travel in the direction of inflation as will other hard assets. They also shoot off a lot of income, so maybe more appropriate one of your retirement accounts. International bonds are also good as they offer income and a currency hedge.